Although Jonathan Dove is best known as a vocal and choral composer, with operas and works for children forming the backbone of his output, his chamber music reveals similar predilections for narrative, drama, atmosphere and a sense of the personal. 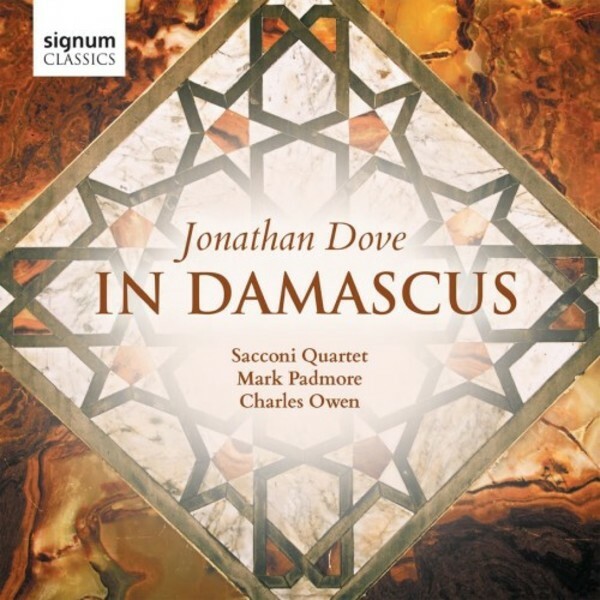 His new commission from the Sacconi Quartet, In Damascus, was inspired by violinist Hannah Dawson�s suggestion for a work that should reflect aspects of the conflict in Syria; not because music can offer any political solution, but simply as an expression of empathy, sorrow, even outrage at those terrible events. Featuring a performance by tenor Mark Padmore, the text is taken from prose-poems by Ali Safar that draw on his first-hand experiences in Syria, eloquently translated by Anne-Marie McManus. In Damascus picked up excellent reviews in both the Guardian and the Financial Times, following its London premiere at the Sacconi's 15th birthday concert at Kings Place last July. The Guardian awarded the concert five stars, describing it as "unusual and timely", with a libretto that is "both simple and direct, without any hint of rhetoric or sensation". Mark Padmore was praised for his "immaculate artistry", and the Guardian concluded that "The overall impact of the work and its performance was profound, an unforgettable example of the power of art to convey something terrible through an expression that is paradoxically in itself beautiful."